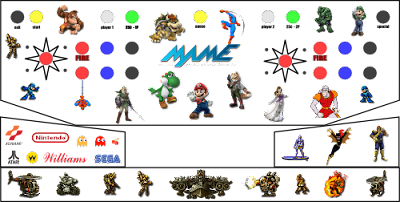 Here's my and my Son's effort for a MAME console design. Not the prettiest, but it was fun creating it. I've sent it to the printer's and it should be ready tomorrow. The one I sent to the printer doesn't have the circles nor the black border which comes from my original design when I built it three years ago. The format that they liked the best was the PDF version which Inkscape exported without any problems. The mistake I made was to not to shrink the "paper" to the size of all the boxes so I ended up paying for a little extra white that I probably won't need (it ended up being R$35.11). I think I should have also left cut marks in the diagram to make it easier to align and cut out the pieces, we'll see if that will be necessary.